Young Driver related crashes are an area of high concern & identified as a continuing road safety issue across the cluster. Wairarapa Wide: 16 to 24 year olds most represented age group in injury crashes on local roads, state highways & mostly at fault at the time of the crash. Drive.govt.nz gives free, practical info to make it easier to pass your restricted test. 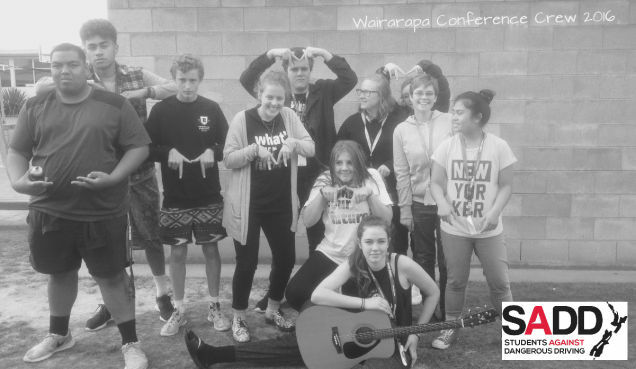 We are very excited to announce that SADD is being supported in 100% of Wairarapa Colleges. We meet every month as a council to discuss areas of concern and how we can promote safe driving practises (including not driving whilst intoxicated or getting in a car with someone else that has been drinking) not only to our peers but stretch our message out into our community. For more information on Events and what our local SADD students are up to click here. Visit the National SADD Page to see what is happening around the country! As a result of the Mayoral Task Force for Jobs initiative and the Social Sector trial a steering group was set up by Masterton Mayor Lyn Paterson, to explore how we best support some local secondary students to gain their restricted licences prior to exiting school. We know that young people who hold a drivers licence are better placed to gain local employment and thus contribute meaningfully to the region economically, and socially. We also know that most of our ‘at risk’ youth have no access to best practice driver training, finances or a driving mentor. Unless this is addressed they would rely on unsafe and illegal cars, indulge in unsafe driving and enter the justice merry-go-round, because of tickets and court appearances. 21 students have successfully passed through the CDMP programme attaining their Restricted Licences. Of these 17 passed on their first attempt and those 4 passed on their 2nd attempt. We also have 3 more booked to sit their restricted before Christmas and several who are keen to take the opportunity in 2018. This is an amazing achievement for these students from Makoura, Kuranui, Chanel and Wairarapa Colleges, but it could not have been achieved without the dedication and commitment of their teachers, mentors, driving instructors, and our sponsors. Our mentors deserve special thanks, these are the folks who are voluntarily giving up their time week after week because they are committed to our goal of helping these students to make the very best of this opportunity. We are already aware of students gaining employment on the strength of being able to legally drive! Special thanks also to Brendan at Southey Honda, Kevan Dudson at Caltex, and Matt Bain at Sign factory, Anita at REAP Reception, Waggs Holden, our funding providers Masterton, Carterton and South Wairarapa District Councils, Masterton Lands Trust, Greater Wellington Regional Council, Wairarapa Road Safety Council, NZTA and others who have preferred to remain nameless – we are fortunate to live in a community where the business, private and public sectors have all caught our vision and stepped in to help to achieve our goal of safer young drivers on our roads. After attending the first NZTA professional development workshop in Trentham in early 2015, I was not a teacher, but I was convinced of the importance to highlighting road safety education within our school networks in Wairarapa. Now to present day, March 3rd 2016, a similar workshop was held in Wairarapa at the Copthorne, Solway Park with 50 educational brains under one roof. This time, we were able to witness a shift in thinking towards road safety as a culture and the impact that our roading network has on our choices in day-to-day living. “One of my favourite speakers was Rachel Bolstad, her presentation on Key Competencies stood out for me as it reminded me of the importance of lifelong learning”. “There may be some barriers mostly around the fact that we are a country school. I did however get some contacts from the workshop that can help me with implementing ideas specific to our school”. Having a vast collection of teachers that educate students in rural, urban and mixed zone environments tested each subject’s adaptability. In all cases, the overall day didn’t just teach us how to implement road safety education into school curriculum and create lifelong learning examples to embed in students, but it helped us learn about our own citizenship through inquiry and action.